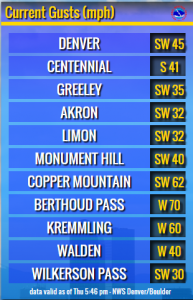 A very strong down slope event along the front range caused strong winds, high temperatures and very low humidity today. These events are not entirely uncommon, especially for this time of year. I even mentioned in my last post that we had a stretch of weather just like this almost exactly a year ago. Today many temperature records were tied or broken and strong winds blew cars around all day, exacerbated fires that started and even caused some damage in areas. With this pattern in place a few more days, I would not be surprised to see more records tied or broken through at least Saturday. 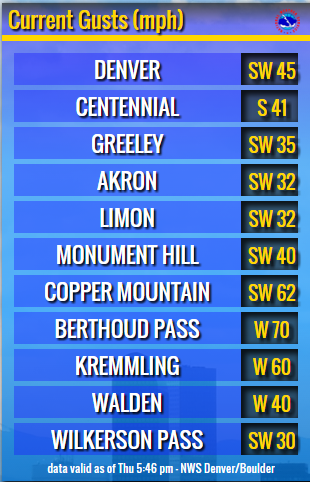 Some areas in and around Denver actually approached 80 degrees! The system responsible for creating our windy conditions will begin to move East away from Colorado. The high pressure system will remain over the area for a little longer, meaning warm and dry conditions will continue through the weekend. I’ve explained how this pattern keeps us very warm and dry before and it looks to persist for a little while longer. The high pressure ridge looks to break down int o Sunday as a storm system and associated cold front makes its way through the area. This means expect much cooler temperatures on Sunday and even a small chance of rain or snow into Monday. We’ll have some details on that storm system out sometime this weekend, but at this time it looks very minor. Expect calmer winds on Friday but breezy conditions will remain. Temperatures will be pleasantly warm. 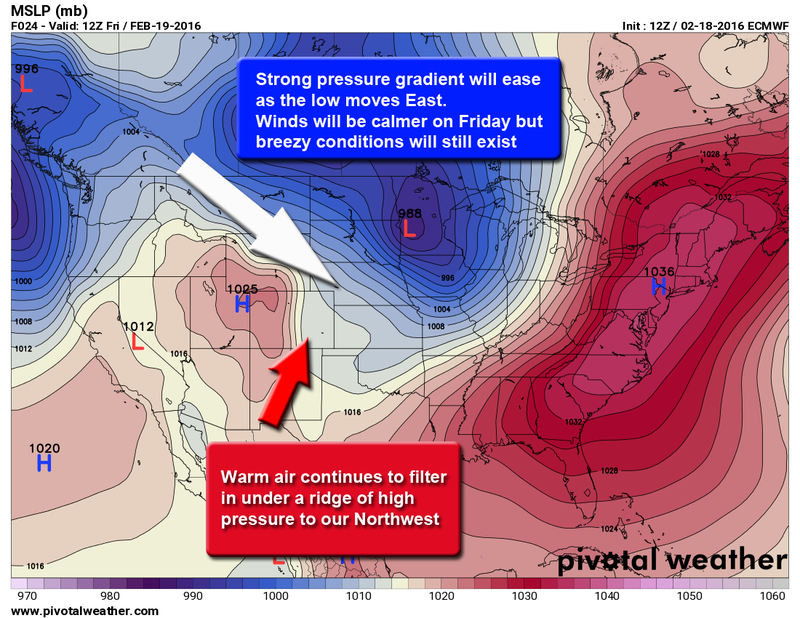 Stay tuned for the weekend outlook on Friday and a preview of our minor storm system early next week!